Enable Epic Oil Rig Clean Up- Gulf of Mexico- with Aquatech! ENABLE-IT ETHERNET EXTENDERS REACH NEW DEPTHS TO AID VISIBILITY FOR GULF OF MEXICO OIL RIG COLLAPSE! Maximum Protection – Ensures accurate view of work region, dramatically reducing risk of equipment damage. Improved Data Delivery – Provides work teams with up-to-date, accurate sonograms. Monetary Savings – Low cost of unit is matched by PoE energy efficiency. Time Savings – Workers relying on accurate imaging are able to complete complex tasks in record time. Ease of Implementation – Unit’s compact design is perfectly matched to system configuration. The oil rig collapse that triggered the disastrous 2010 Gulf of Mexico oil spill sent tons of wreckage to the ocean floor. Before any of the debris could be excavated, however, the sediment layering the wreckage had to be removed by a pipe-like tool extending 900ft. from the ocean’s surface to the debris below. The challenge facing the worker operating the tool topside was visibility. Since the water was far too murky for camera images, surface sonar was employed to give the operator a ‘view’ of the scene below. Unfortunately, surface sonar provided very limited image accuracy. This shortcoming often resulted in operator error, damaged equipment, and major slowdowns. Enter AquaTech, a leading provider of underwater equipment to the Survey, Diving, ROV, Naval, and the Dredging industries. The company’s solution was to create a guidance system that positioned the sonar unit at the bottom of the tool, close to the action. Such proximity would provide far more accurate sonograms to the tool operator. Of course, the sonogram data would have to travel the full 900ft. from ocean bottom to the topside work area. The challenge facing Aqua Tech, therefore, was developing a long-distance communications channel with the necessary high density data rate. Aqua Tech investigated a number of solutions that would help convert this goal from concept to reality. The team considered increased power, larger conductors, and Ethernet extenders. Realizing extenders made the most sense, they narrowed their selection to the most promising candidate — the Enable-IT 828P. – Enable-IT TO THE RESCUE! 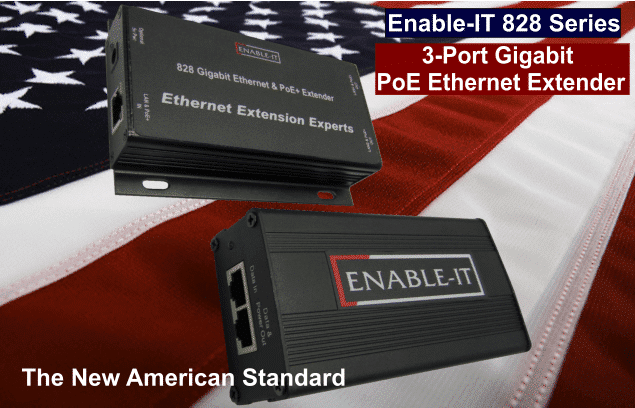 Enable-IT 828 series 3-port gigabit PoE Ethernet Extender for cleaning the oil from the bottom of the ocean in Mexico! Once the AquaTech guidance system was implemented, the 828P backed up its promise with high performance. A major reason for the unit’s effectiveness is its compactness. The configuration required an 828P unit to be installed on a cable every 350ft, creating a series of repeaters from the ocean floor to the surface. Each of the four units employed in the network is stored in a small pressure vessel. Large, bulky extenders would have been a cumbersome impossibility in this setup. Data delivery jumped to a whole new level thanks to the 828P. The far-more precise sonograms generated at ocean floor depth travel the 900ft. distance at blazing Gigabit speed, giving tool operators the necessary accurate view of the gulf debris area. The results speak for themselves. Because of the enhanced data accuracy and precision guidance provided by the 828P, sediment removal and excavations are being completed in record time – without the costly tool damage so common with the prior system. Al Rougeau of AquaTech points out that all data entering the system arrives at its destination unaltered and intact, making the 828P units essentially transparent. It’s as if there were no repeaters involved. Even if non-standard Ethernet protocol were to be used, the transparency would still remain. The 828P also has proven itself extremely budget-friendly. Not only is the unit available at a fraction of the price tag carried by other solutions, the 828P continues to pay for itself by maximizing energy-efficiency. A primary reason for the energy savings is the unit’s PoE design, which eliminates the need to employ an additional pair of conductors.